Overview of the most popular cities and sights in the west of Germany; just click on the links and you’ll find more information about the different travel destinations in Germany. 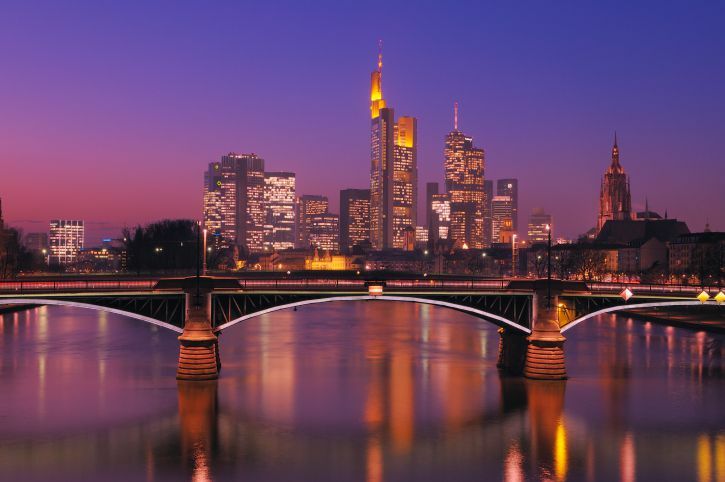 Located in the federal state of Hesse in the heart of Germany, Frankfurt is the financial center of Germany. Thanks to its International Airport, one of the busiest in the world, Frankfurt is for many travelers the gateway to Europe. Being an internationally diverse city, Frankfurt hosts many important events, among them the International Book Fair in October, the biggest of its kind in the world. Heidelberg is one of the few German cities that weren’t destroyed in World War II; plenty of old world charm fills the narrow cobblestone streets of its Old Town, which was the center for Germany's romantic period. The ruins of the once grand Heidelberg castle, the oldest university in the country, and the idyllic river valley make this city one of the most picturesque destinations in Germany. Located on the banks of the river Rhine, Cologne was founded by Romans in 38 BC and is one of Germany’s oldest cities. The centerpiece and heart of the city is the soaring Cathedral of Cologne, one of the most significant architectural masterpieces in the country. Cologne is also well known for its contemporary art scene, excellent museums, and the most colorful carnival celebrations in Germany. Düsseldorf, the capital of North Rhine-Westphalia, offers an interesting mix of old and new, from traditional breweries and gastro pubs, to futuristic architecture by Ghery and Chipperfield. Düsseldorf is famous for its luxury shopping boulevard Koenigsallee and hosts the world’s biggest fashion trade fair. The German wine road in Rhineland Palatinate is the country’s oldest scenic drive. Starting in the southwest of Germany, the 50 miles long route snakes through Germany’s second largest wine growing region all the way to the French border. Enjoy Palatinate's 1000-year old viniculture in quaint wine villages, old-world restaurants, colorful vineyards, and at local harvest festivals. The dramatic natural landscape of the Upper Middle Rhine Valley, which stretches 40 miles from Bingen to the city of Koblenz, is a UNESCO world heritage site. For a memorable road trip, follow the loops and sways of the Rhine through the terraced vineyards, while castles are greeting from the steep hills; highlights of the region include Bacharach, one of the best preserved medieval towns in Germany, and the famed Lorelei, an impressive slate rock, which soars almost 400 feet above the Rhine. On the banks of the Moselle River lies Trier, Germany's oldest city. Trier was founded as a Roman colony in 16 B.C. and became the favored residence of several Roman emperors. Nowhere else in Germany is the evidence of Roman times as vivid as it is in Trier; highlights of the city include the Porta Nigra, the largest Roman city gate north of the Alps, and the Cathedral of Trier, which houses a holy relic that draws many pilgrims: the Holy Robe, the garment said to be worn by Jesus when he was crucified. Mainz, the state capital of Rhineland Palatinate, is located in the southwest of Germany; one of its most famous residents was Johannes Gutenberg, who revolutionized communication by inventing the moveable type printing press in the 15th century. Mainz is also home of the 1000-year old Roman Catholic Cathedral of Mainz, one of the most important Romanesque structures along the Rhine. 90 km southwest of Cologne you’ll find Germany’s most famous racetrack, the Nürburgring. Established in 1927, it has been regarded as the toughest Grand Prix circuit of all. The “Ring”, home of the Formula 1 world championships, offers plenty of opportunity for Michael Schumacher fans to experience the thrill of racing first hand. You can drive laps in your own car, hop on a speedy BMW Ring Taxi, visit an interactive exhibition, or take safety-driving classes. Speyer, located along the banks of the Rhine River in the southwest of Germany, is famous for its Imperial Cathedral from the 11th century, one of Germany's largest and most important. Its crypt contains the tombs of eight German emperors and kings as well as several bishops.